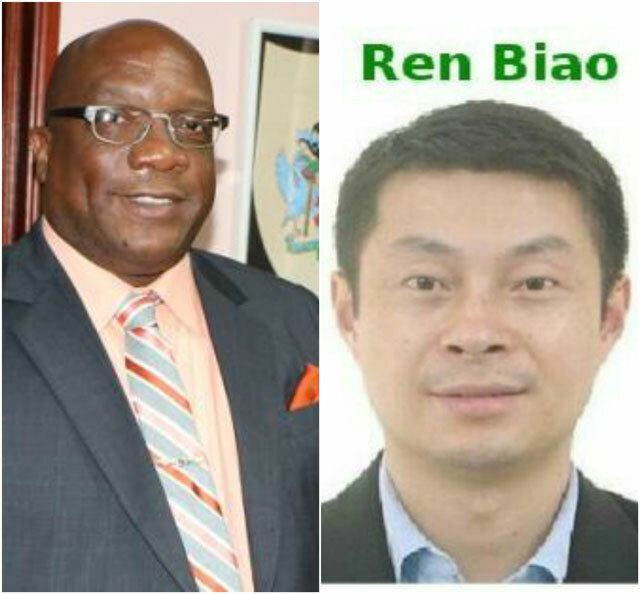 Basseterre, St. Kitts-Local security officials in St. Kitts and Nevis are set to investigate alleged Chinese fugitive Ren Biao who is seeking refuge in St. Kitts and Nevis according to Chinese government officials. The issue of the alleged fugitive has dominated the national discussion for the week with some calling for a swift resolution to the matter with others even calling for the resignation of government officials. The story came to light when a report from the Carib Update’s News Break and broadcaster Oslyn Crosby stated that the Beijing Government had received no corporation from the Government of St. Kitts and Neivs concerning the individual who is a citizen by investment and is accused of swindling over US$100M from a Chinese-state firm. Giving an address to the nation on Tuesday evening Dr. Harris dismissed allegations that Government Officials were to be paid US$190,000 for protecting the individual in question. He also denied claims that the Government was harbouring any fugitives. “I categorically deny as well the assertion that my Government is somehow failing to cooperate with a request with any country as mandated by law. I state further that no evidence has been provided to law enforcement or otherwise that any public official has been offered or has received any money for protection in this matter,” he said. Dr. Harris stated that the individuals concerned applied for and obtained St. Kitts and Nevis citizenship in September 2013 during the tenure of the Denzil Douglas administration. He further indicated that on 26 May, 2014 USNCB Interpol Washington issued a Red Notice for those in question. “On the face of the Red Notice it is clearly stated that it was circulated to the media including the internet,” Dr. Harris said. He then noted that in July, 2014, the Interpol Office in Washington DC advised the authorities in St. Kitts that the individuals in question were traveling to St. Kitts and gave details of travel times. “The individuals were to arrive into St. Kitts on British Airways Flight 2157 at 15.40 via Antigua. The authorities were asked to take action,” he said. He said the then Prime Minister Dr. Denzil Douglas despite being aware of the notice took no action into the matter. “No effort was made to deny these individuals permission to land in St. Kitts and Nevis. No effort was made to initiate any proceedings against or in relation to these individuals. No steps whatsoever were taken in relation to the Interpol Red Notice,” said the Prime Minister. Dr. Harris explained that requests for legal assistance are governed by the Mutual Assistance in Criminal Matters Act. He noted that the act speaks to co-operation in criminal matters between St. Kitts and Nevis and Commonwealth countries or countries in which have a specific agreement with St. Kitts and Nevis. He added that China falls into none of those categories. The Prime Minister stated that following an examination of relevant laws, international conventions and bilateral treaties there is no basis for extraditing St Kitts and Nevis citizens in this way. He added that the country cannot allow the sovereign laws to be trodden upon by any nation attempting to engage in taking any citizen from St. Kitts and Nevis. Dr. Harris then referenced similar cases made by the Chinese Government on several citizen resident outside of that country and was of the opinion that the laws of those countries had to be respected. This then is not unique to St. Kitts and Nevis. It is a feature of all mature democracies rooted in the Rule of Law. Dr. Harris then disclosed that the matter is under active investigation by the federal government. He added that the government has instructed the relevant law enforcement and investigative agencies to investigate the claims against these individuals. Dr. Harris also promised that the government shall continue to update the public as further information comes to light. On Monday morning however Dr. Harris slammed the members of the opposition and claimed that the matter is another distraction by the former administration. Dr. Harris stated that is was the former administration who provided citizenship to Biao and questioned whether there other motivations. Deeming what, he claimed, the previous Administration did was an act of hypocrisy, Dr. Harris postulated that the Federation should be aware that in 2014 a request was sent by Interpol to the Douglas Administration. Response of the Opposition in this matter have been highly critical of the Timothy Harris Administration. Dr. Douglas in a release called for Dr. Harris’ resignation in the handling of the matter, while other members protested Dr. Harris outside his radio interview on Monday. The Observer telephoned the Chinese embassy in Antigua on Tuesday of this week seeking information on this matter.We spoke to a MR.Wan who took our telephone number and promised to call us back but up to press time we have not received a returned call. Next articleAll should be treated equally under the law.